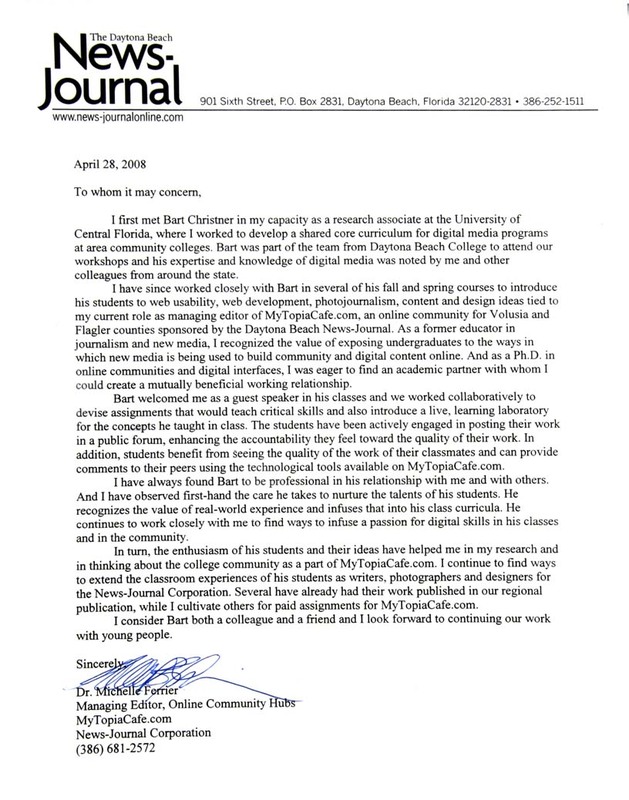 I first met Bart Christner in my capacity as a research associate at the University of Central Florida, where I worked to develop a shared core curriculum for digital media programs at area community colleges. Bart was part of the team from Daytona Beach College to attend our workshops and his expertise and knowledge of digital media was noted by me and other colleagues from around the state. I have since worked closely with Bart in several of his fall and spring courses to introduce his students to web usability, web development, photojournalism, content and design ideas tied to my current role as managing editor of MyTopiaCafe.com, an online community for Volusia and Flagler counties sponsored by the Daytona Beach News-Journal. As a former educator in journalism and new media, I recognized the value of exposing undergraduates to the ways in which new media is being used to build community and digital content online. And as a Ph.D. in online communities and digital interfaces, I was eager to find an academic partner with whom I could create a mutually beneficial working relationship. I have always found Bart to be professional in his relationship with me and with others. And I have observed first-hand the care he takes to nurture the talents of his students. He recognizes the value of real-world experience and infuses that into his class curricula. He continues to work closely with me to find ways to infuse a passion for digital skills in his classes and in the community. In turn, the enthusiasm of his students and their ideas have helped me in my research and in thinking about the college community as a part of MyTopiaCafe.com. I continue to find ways to extend the classroom experiences of his students as writers, photographers and designers for the News-Journal Corporation. Several have already had their work published in our regional publication, while I cultivate others for paid assignments for MyTopiaCafe.com.